It’s Thanksgiving time, and that means it’s time for Viaje’s Thanksgiving seasonal cigar releases. This week Viaje shipped its Viaje Stuffed Turkey White and Dark Meat editions to its authorized retailers. Select retailers also received the Viaje Zombie Farmer Bill Hatchet. The Viaje Stuffed Turkey made its debut in 2011 as a Nicaraguan puro. Measuring 5 x 60, it also marked the company’s first 60 ring gauge cigar. It was originally released as a part of the “White Label Project” line. This line is a mechanism for Viaje to release experimental blends and sizes, factory errors, etc. In 2012, the Stuffed Turkey was expanded to two blends. The original 2011 blend was rebranded as the Stuffed Turkey White Meat, and a San Andres Maduro wrapped version was added and dubbed the Stuffed Turkey Dark Meat. The Stuffed Turkey White Meat and Dark Meat versions returned in 2013. For 2014, the sizes were changed to 5 x 58 cigars. In addition, the Stuffed Turkey White Meat and Dark Meat versions were moved out of the White Label Project series and received its own banding and packaging. These have remained annual releases with two exceptions: in 2016 the line was given the year off, and in 2017 box-pressed editions of the Stuffed Turkey were released and dubbed as “Edicion Limitada” releases. The 2018 editions of the Stuffed Turkey White Meat and Dark Meat are both available in 25-count boxes. Also returning is the Viaje Zombie Farmer Bill Hatchet. 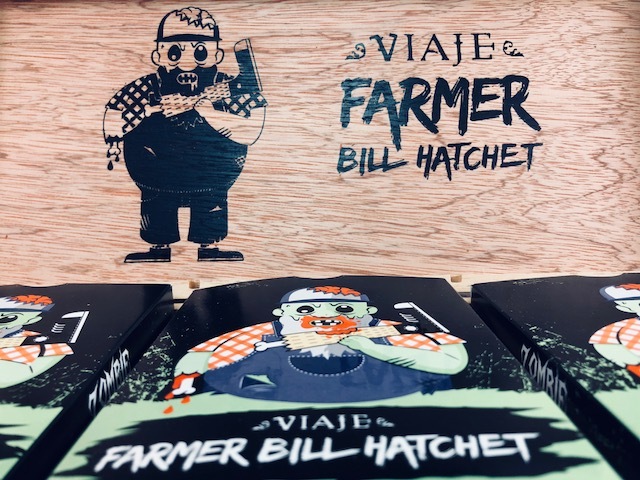 Back in 2014, Viaje released a 7 x 52 box-pressed Nicaraguan puro known as Farmer Bill Hatchet. That release would make a return in 2015. In 2016, Farmer Bill Hatchet was changed to Zombie Farmer Bill Hatchet. This new incarnation was a 5 1/2 x 54 box-press with blend details not released. Since 2016 it has been the Zombie Farmer Bill Hatchet that has been released annually with select retailers receiving the 2018 edition. As for the “Zombie” theme, it is one that is found across many Viaje lines, but details around the blend have not been disclosed. Like in previous installments Zombie Farmer Bill Hatchet is being offered to retailers in 30-count boxes – each containing six five-packs of the Zombie Farmer Bill Hatchet.